For other uses, see Teddy bear (disambiguation). A teddy bear is a soft toy in the form of a bear. Developed apparently simultaneously by toymakers Morris Michtom in the U.S. and Richard Steiff in Germany in the early years of the 20th century, and named after President Theodore "Teddy" Roosevelt, the teddy bear became an iconic children's toy, celebrated in story, song, and film. Since the creation of the first teddy bears which sought to imitate the form of real bear cubs, "teddies" have greatly varied in form, style, color, and material. They have become collector's items, with older and rarer "teddies" appearing at public auctions. Teddy bears are among the most popular gifts for children and are often given to adults to signify love, congratulations, or sympathy. 3.1 "The Teddy Bears' Picnic"
A 1902 political cartoon in The Washington Post spawned the teddy bear name. Morris Michtom saw the drawing of Roosevelt and was inspired to create a teddy bear. He created a tiny soft bear cub and put it in the shop window with a sign "Teddy's bear", after sending a bear to Roosevelt and receiving permission to use his name. The toys were an immediate success and Michtom founded the Ideal Novelty and Toy Co.
At the same time in Germany, the Steiff firm, unaware of Michtom's bear, produced a stuffed bear from Richard Steiff's designs. 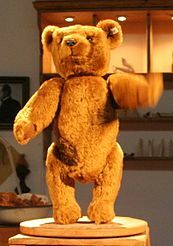 Steiff exhibited the toy at the Leipzig Toy Fair in March 1903, where it was seen by Hermann Berg, a buyer for George Borgfeldt & Company in New York (and the brother of composer Alban Berg). He ordered 3,000 to be sent to the United States. Although Steiff's records show that the bears were produced, they are not recorded as arriving in the U.S., and no example of the type, "55 PB", has ever been seen, leading to the story that the bears were shipwrecked. However, the story is disputed – author Günther Pfeiffer notes that it was only recorded in 1953 and says it is more likely that the 55 PB was not sufficiently durable to survive until the present day. Although Steiff and Michtom were both making teddy bears at around the same time, neither would have known of the other's creation due to poor transatlantic communication. North American educator Seymour Eaton wrote the children's book series The Roosevelt Bears, while composer John Walter Bratton wrote an instrumental "The Teddy Bears' Picnic", a "characteristic two-step", in 1907, which later had words written to it by lyricist Jimmy Kennedy in 1932. While early teddy bears were covered in tawny mohair fur, modern teddy bears are manufactured in a wide variety of commercially available fabrics, most commonly synthetic fur, but also velour, denim, cotton, satin, and canvas. Commercially made, mass-produced teddy bears are predominantly made as toys for children. These bears either have safety joints for attaching arms, legs, and heads, or else the joints are sewn and not articulated. They must have securely fastened eyes that do not pose a choking hazard for small children. These "plush" bears must meet a rigid standard of construction in order to be marketed to children in the United States and in the European Union. There are also companies, like Steiff, that sell handmade collectible bears that can be purchased in stores or over the Internet. The majority of teddy bears are manufactured in countries such as China and Indonesia. A few small, single-person producers in the United States make unique, non-mass-produced teddy bears. In the United Kingdom one small, traditional teddy bear company remains, Merrythought, which was established in 1930. Mohair, the fur shorn or combed from a breed of long haired goats, is woven into cloth, dyed and trimmed. Alpaca teddy bears are made from the pelt of an alpaca because the fiber is too soft to weave. In addition to mohair and alpaca, there is a huge selection of "plush" or synthetic fur made for the teddy bear market. Both these types of fur are commercially produced. Teddy bears are a favourite form of soft toy for amateur toy makers, with many patterns commercially produced or available online. Many "teddies" are home-made as gifts or for charity, while "teddy bear artists" often create "teddies" for retail, decorating them individually with commercial and recycled ornaments such as sequins, beads and ribbons. Sewn teddy bears are made from a wide range of materials including felt, cotton and velour. While many are stitched, others are made from yarn, either knitted or crocheted. Michtom's jointed mohair "Teddy's bear" was very popular when first designed and remains so with collectors today. Fake bears look suspiciously new and unhandled: their noses are unworn, and their seams may be thick and uneven. All Ideal bears have jointed hips, necks, and shoulders. Early examples have a characteristic "American football" shape and are mostly made of short gold or beige mohair plush with matching felt paws, and distinctive, sharply pointed foot pads. They have shoe-button or glass eyes, and the fur around the muzzle may be shorn. Later bears were made in a large variety of colours and types—for example, pandas—and had longer fur. Other collectible bears include ones by the Knickerbocker Toy Co. (active 1924–1925) in New York, which are clearly marked with a label in the front seam. Similar to many early American bears, Knickerbocker bears usually have long bodies, small feet, and short, straight arms and legs. Their later bears can be recognized by their large inverted ears and big noses. Other collectible bears include Gund Manufacturing Co. (est. 1898), now in New York, and "Hershey's bears", which were designed to promote The Hershey Company's chocolate bars. Retail sales of stuffed plush animals including teddy bears totaled $1.3 billion in 2006. The most commonly sold brands include Gund and Ty Inc. Brands associated with teddy bears that enjoyed strong popularity in the 1980s and 1990s are Teddy Ruxpin and Care Bears. Various TV shows and movies have a teddy bear depicted, such as Super Ted and Mr. Bean. Teddy bears have seen a resurgence in popularity as international "do-it-yourself" chains have opened. Among the largest and best-known are Build-A-Bear Workshop and Vermont Teddy Bear Company. Some popular mass-marketed teddy bears made today include Rupert, Sooty, Paddington, and Pudsey Bear. Books have also been written with the teddy bear featured as their main character. These include Winnie-the-Pooh, Corduroy, Teddy Tells Time, Tristan the Teddy Bear (from the Teddy Bear Tales) and Teddy Dressing. The popularity of the toy inspired John Walter Bratton to compose the melody "The Teddy Bears' Picnic" (1907). The lyrics were added in 1932 by Jimmy Kennedy. 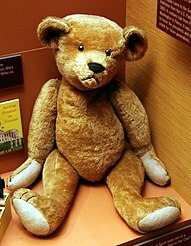 The world's first teddy bear museum was set up in Petersfield, Hampshire, England, in 1984. In 1990, a similar foundation was set up in Naples, Florida, United States. These were closed in 2006 and 2005 respectively, and the bears were sold in auctions, but there are many teddy bear museums around the world today. On April Fools' Day 1972, issue 90 of The Veterinary Record published a paper on the diseases of Brunus edwardii detailing common afflictions of teddy bears. Winnie-the-Pooh is the name of a fictional character created by A. A. Milne, based on a teddy bear owned by his son Christopher Robin, who was the basis of the eponymous character in A. A. Milne's work. 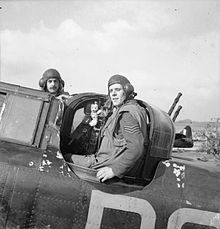 Milne wrote many stories featuring Pooh Bear, some of which were adapted by the Walt Disney Company into theatrical shorts or compiled into movies such as 1977's The Many Adventures of Winnie the Pooh and the 2011 film Winnie the Pooh. Ted (2012), and its sequel, Ted 2 (2015), are comedy movies, raunchy spoofs of stories where children's teddy bears come to life. Misery Bear a series of short films published on the BBC website. ^ "Holt Collier" (PDF). Retrieved 2013-09-26. ^ a b "Teddy Bears". Library Of Congress. Retrieved 2007-12-10. ^ a b Clay, Marianne (2002). "The History of the Teddy Bear". Teddy Bear & Friends. Madavor Media, LLC. Archived from the original on 2011-07-23. Retrieved 2007-12-10. ^ "Theodore Roosevelt Association. The story of The Teddy Bear". Theodoreroosevelt.org. 2013-02-01. Archived from the original on 2013-03-17. Retrieved 2013-09-26. 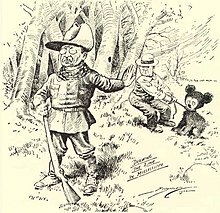 ^ "Real Teddy Bear Story - Theodore Roosevelt Association". www.theodoreroosevelt.org. Retrieved 2018-04-11. ^ "Bring on the Berg". Alex Ross: The Rest Is Noise. ^ "Seymour Eaton". Greater Lansdowne Civic Association (GLCA). 2003. Retrieved 2007-12-10. ^ "Build-A-Bear Workshop Inc" (PDF). Archived from the original (PDF) on 2013-05-22. Retrieved 2013-09-26. ^ "Officers using the Teddy Bear Cops program". Teddybearcop.com. Retrieved 2013-09-26. ^ "Brunus edwardii (1972)". Retrieved 27 March 2010. ^ Blackmore, DK; DG Owen; CM Young (1972). "Some observations on the diseases of Brunus edwardii (Species nova)". Veterinary Record. 90 (14): 382–385. doi:10.1136/vr.90.14.382. Archived from the original on 22 November 2008. Retrieved 27 March 2010. Look up teddy bear in Wiktionary, the free dictionary.